A new approach in the field of comparative myth! Where Mircea Eliade created the discipline of comparative myth and Georges Dumézil structured Indo-European mythology, Witzel largely breaks with both these authors and takes several steps ahead and takes a path in which he stands alone so far and from which many things have yet to be worked out. A brave step in the conservative world of scholarship. 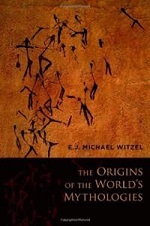 Witzel uses different disciplines to come to his conclusions, most notably linguistics, genetics and comparative myth; an approach that he coined “historic comparative myth”. Along the lines of genetics, linguistics and archeology scholars know what peoples came from where and from what predecessors. Witzel uses these trails to compare the mythologies. Genetics has found out that all current humanity stems from one mother. Not that there was one couple at some point, it is just the descendants of other lines did not make it. Linguists are by now beyond groups such as Indo-European and Semitic and have found overarching language groups like Nostratic. Witzel takes his comparative mythology yet another step further (initially, and then a couple more) by reaching a family that he calls “Laurasian”. What is not Laurasian mythology today is “Gondwana” which is in fact the origin or Laurasian mythology. Our common female ancestor is called the “African Eve” and her descendants left Africa (the ‘out of Africa’ theory) some 65.000 years ago and then spread around the world. Along that path Laurasian mythology was developped, other peoples sticked to the Gondwana type. Witzel says to be fairly able to reconstruct the Laurasian “story line” and by comparing Laurasian myth to non-Laurasian, he even catches glimpses of Gondwana mythology. More even, what is common in both, will eventually be the ultimate source of all mythologies: “pan-Gaean”, into which the author gives a peek as well. Witzel’s book is not a ‘comparative myth’ book, but a book in which Witzel explains and builds his theory. He also looks at (possible) counterarguments and deals with questions that are left. Indeed, his theory is a theory in childhood, but after 20 years of investigation, Witzel found it time to present it to the world and have his colleagues stab at it. I suppose the book will raise quite some resistance. Linguistics say that reconstruction of language beyond a few thousand years is impossible and Witzel has to work with reconstructions based on reconstructions (of language and mythology) to go back tens of thousands of years. The book makes staggering jumps in time and, like I said, leaves little of the theories of Eliade and especially Dumézil, but it does confirm with my Traditionalistic outlook (in a way) that there is a common origin of everything. “The Origins Of The World’s Mythologies” makes an interesting read with tons of little facts and comparisons and a fresh, new theory to think about.